Extracted from the leaves of an ancient tree, ginkgo biloba has been scientifically shown to nourish the circulation of blood to the brain which results in strong memory and concentration. A popular herb in the United States, ginkgo helps rid the body of free radicals, supports blood vessel health, and ensures an optimal supply of blood to the brain. The optimized delivery of blood to the brain may improve memory, mood, and concentration in the early stages of Alzheimer’s disease. Another benefit may be increased blood supply to the limbs. 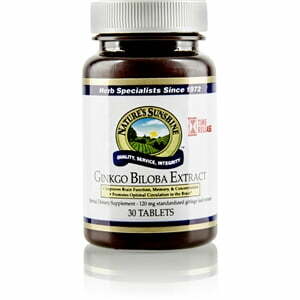 One pound of ginkgo biloba extract requires fifty pounds of ginkgo leaves. Nature’s Sunshine Ginkgo Biloba is specially formulated to release slowly so the body experiences the benefits throughout the day. 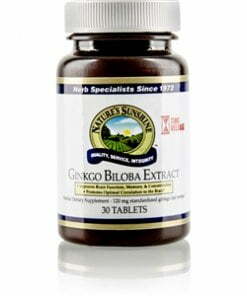 The 120 mg of concentrated ginkgo biloba extract contained in each tablet consists of 24 percent ginkgo flavone glycosides and 6 percent terpene lactones. Instructions: Take one tablet daily, preferably with the morning meal. Each specially-processed tablet slowly releases its contents providing continual benefits all day. Maltodextrin, cellulose (plant fiber), stearic acid (vegetable), magnesium stearate, and silicon dioxide (powdered silica).